Breathtaking! My finishing time, I mean. The sights on the brand new route were wonderful but there’s nothing like finishing significantly faster than anticipated. 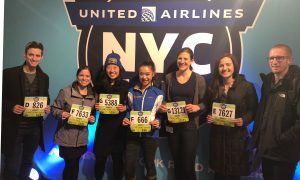 On Sunday, March 18th, I raced through the streets of Brooklyn and Manhattan with almost 22,000 runners and smashed the United Airlines NYC Half 2018 with a new PR! 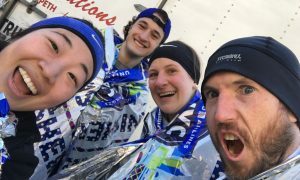 This race was my first sub-2 half marathon last year so I was excited for what round two had in store for me. My biggest fear was that this new course isn’t “negative split friendly.” The second half is extremely hilly, especially with the final miles being those notorious rolling hills of Central Park. Regardless, I made a secret, moonshot goal to break 1:50. But I would be content with a sub-1:53 finishing time. I’ve worked hard to stay motivated after my TCS New York City Marathon debut and needed this race as my big comeback. To make the most of the exorbitantly expensive registration fee of $130, I buckled down and got serious about training. Building my base after taking time off from marathon training was rough. 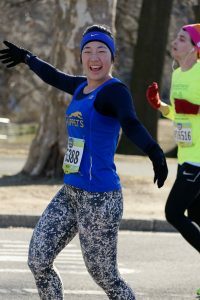 At the time, I didn’t understand how I raced 26.2 miles, but struggled to complete a simple 5 mile run. I knew I was prone to being hard on myself for this temporary “setback.” But one of my goals this year is to be self-forgiving. 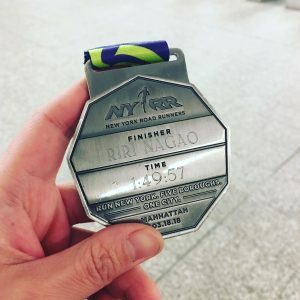 Instead of blaming my inability, I thought of this as part of the marathon recovery process and enjoyed running for the sake of running. I needed the time to recuperate. I was confident that I’d eventually get back into the racing grind. Starting from the end of December, I incorporated road workouts and long runs. It wasn’t a smooth transition from recovery but I did the best I could. I followed the Dashing Whippets training plan and scaled the workouts to my ability. I went to as many workouts with them as my schedule would allow and opened opportunities outside of that to keep up the training momentum. 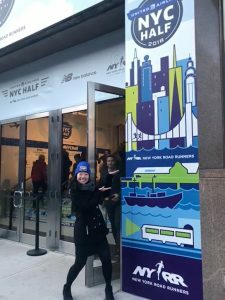 I raced the Fred Lebow Manhattan Half in January as a tune-up and finally broke my Brooklyn Half PR of 1:55 with an official time of 1:54:47. Throughout this training cycle, I ate better and made various lifestyle improvements as well. Bib pickup at the expo with the Whippets! Race day was full of mixed emotions. I was excited, but nervous. I put in the training, even going up to 16 miles for my longest long run, but felt like my efforts were inadequate. Such negative tendencies always come out at major races, and I still didn’t know how to overcome them. But if there’s one thing I learned from my past mistakes, it’s to stop doubting and simply trust that I’ve put in the work. There was only one way to find out. I tightened my laces and toed the starting line. The new course took me from the Grand Army Plaza in Prospect Park, through Flatbush Avenue. We hit the Manhattan Bridge and got a tour of Chinatown. I kept it relatively conservative to save my energy for later and maintained a steady pace of 8:45/mile, in hopes of dropping down to 8:20/mile. There were a few miles through the FDR Drive. This part was such a mental drain. It took energy to dig deep and keep running. Upon approaching the United Nations, I eventually turned onto 42nd Street. The second half would be the ultimate test. As I ran through Grand Central, I shut off my mind and raced like there is no tomorrow. The next turn was at 7th Avenue and it was a glorious victory dash through the iconic Times Square, some of my fastest splits. Once I entered Central Park to crush the final miles, muscle memory kicked in on this familiar turf. I nearly had a collision at mile 11, but I had a PR to chase with no time to spare so I got aggressive. The last 400 meters was an exhilarating, and painful downhill sprint. I hit my moonshot. I finished it in 1:49:57! When teammates celebrate your victory! I’m still in a state of bliss and shock. I have absolutely no idea how I did it. There were too many times throughout the race when I contemplated slowing down. Unlike the previous course, this route had a lot of mentally exhausting stretches because of the lack of cheering or sense of familiarity. On numerous occasions, I had to dig deep and overcome my physical and emotional pain to keep pushing. It was a cold and windy day. There were a lot of deceptively steep hills, sudden turns, and uneven, cracked roads. Despite all this, I held onto the glimpse of hope that I could hit that sub-1:50 and kept running, even when the pain became unbearable. I can’t begin to describe how real it got when I hit the final 200 meter mark with less than 45 seconds to spare. The beastly sprinter in me from my college Track & Field days unleashed – the announcer even made a commentary about “the Dashing Whippets coming through, dashing towards the finish line!” I totally deserved that moment. I’m a sub-1:50 half marathoner and quite frankly, I don’t even recognize myself! I love that this race takes place in March. It gave me something big to work towards during the winter, especially after the marathon high died down. Overall, I enjoy winter running but it’s a struggle to maintain consistency throughout the cold months. I even got sick twice during this training cycle. But regardless of how challenging it was, I loved the process. I pushed through the workouts with my Whippet comrades. They really took me outside of my comfort zone and I can’t credit them enough for this incredible PR. And nothing compares to their cheering stations. I have no words for how fortunate I am to be part of this team. If there’s one major thing I took away from this, it’s that I can do a lot more than I think. I literally say that in every single post-race recap and somehow it hasn’t stuck yet (or that the doubt always kicks back in). As I’m going through a major career change into UX, believing in myself has been one of the hardest things to do. I fear applying to product roles because I think I’m not qualified enough. I shy away from reaching out to industry leaders because of fear of rejection. I need to set moonshot goals for this part of my life too and I might surprise myself. It’s still up for debate whether I’ll be back for round three. But with my history of getting big PRs at this race, it’s tempting to sign up again. Who knows what will happen. 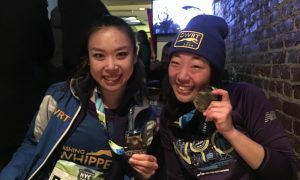 Finally, from the bottom of my heart, I’d love to thank all those that played a big role in supporting this race behind the scenes – the NYRR staff, volunteers, City agencies, and of course, my Whippets teammates who take training, racing and especially cheering seriously – thank you. You all make it possible to keep closing the gap between me and a BQ.